ScootPad’s new school-level proficiency reports give admins and principals a complete overview of performance at a school, classroom, and student level. Today’s post will cover these reports and help you gain in-depth insight into your school’s performance. Review overall proficiency for your school and each individual classroom in both Math and ELA/Reading. Individual classroom overview shows you student engagement metrics, as well as proficiency and Rate of Learning. Proficiency by Grade report lets you review the overall performance for each grade level within your school across both Math and ELA/Reading. 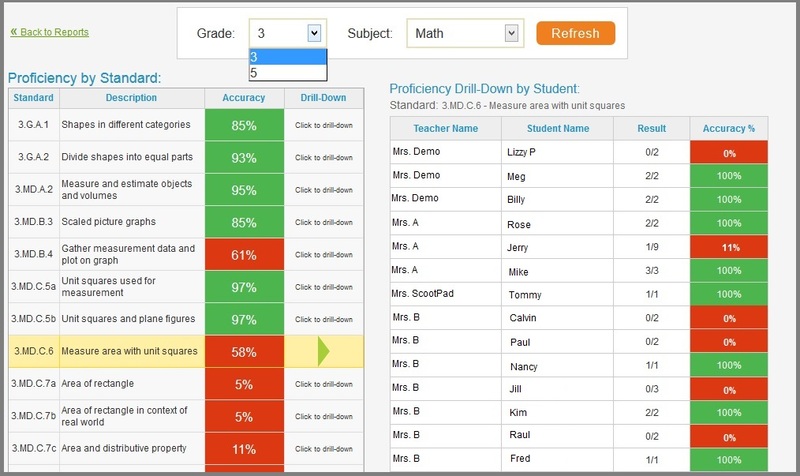 With just one click, you can drill-down to see proficiency levels by each teacher/classroom! Proficiency by Standard report lets you review the average student proficiency across all standards by grade and subject. You can further drill-down to see which classrooms and students need most improvement in the specific standards. If you are a Principal or an Admin, Sign Up for a FREE Admin account on ScootPad and access these new school-level reports for Free (limited time offer)!